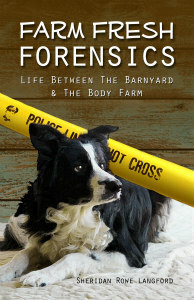 We have 9 dogs - old dogs, new dogs, working dogs, retired dogs. But just because we have bright-eyed promising pups, it doesn't mean that we don't love the retired dogs with cloudy eyes and gray muzzles. 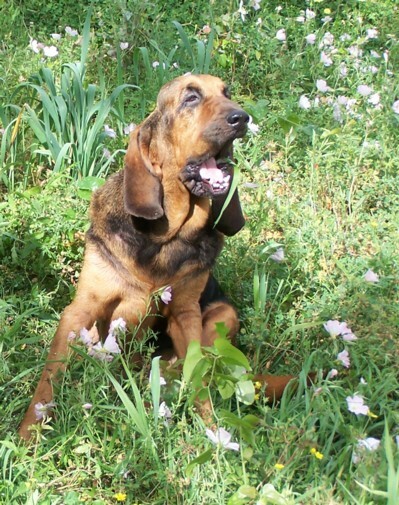 Alice the Bloodhound is my Gollum-Dog. Like Gollum in Lord Of The Rings, she skulks around in her world of darkness, a creature repulsive to others. Tumors are erupting over most of her body and the ordinary rank smell of Bloodhound is magnified by a nasty yeast smell. She is blind and her front teeth are worn down by bouts of near constant chewing. For years, she has lived on antibiotics and steroids. 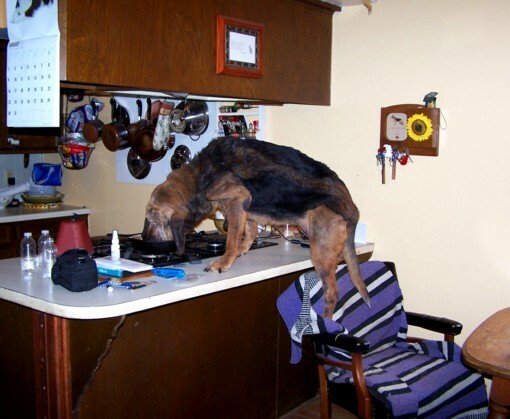 We have tried every dog food, shampoo and ear wash on the market to no avail. We have tried every home remedy on the internet. Things that used to work no longer control her skin problems, and now at her age, I'm leery of even putting anything new into her system. I looked at her yesterday. I can smell Alice before I can even see her. She has raw red tumors popping through the skin like volcanoes. They don't appear to hurt. She has a hearty appetite and eats more than Briar, yet she's skin and bones. She lives in a world of darkness and cloudy shadows, but she's happy. Alice navigates the back yard like a bat in the night. The pack doesn't pick on her. In fact, they dote on her like a grumpy old grandmother. They clean her ears, clean her eyes, and clean the oozing tumors. (Eegaads! YUCK! GROSS!) No one dares to get close to her food bowl. Yet I look at her condition and I cannot help but wonder if we should put her down. Her tumors have tumors. In the past, I've always said that if a dog is still happy and has a hearty appetite, then it's not time, but perhaps I was wrong about Alice. After looking at her volcano tumors again yesterday, I picked up the phone to call Dear-Friend-Married-To-Vet. They will honestly advise me so that I don't let sentiment lead to neglect. So I phoned Dear Friend, and as I walked into the kitchen, I saw The Most Amazing Thing . . . 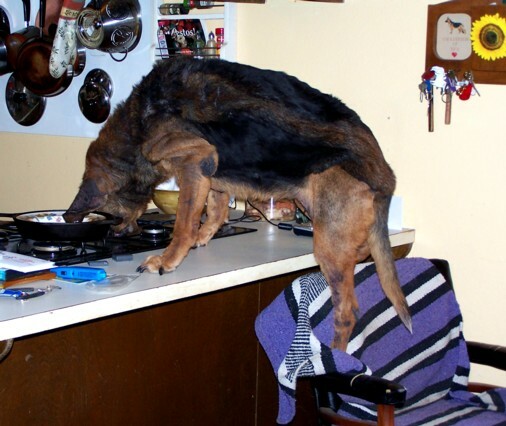 There I was, on the phone, getting advice about putting her down, and with me out of the room, Alice took the opportunity to use a chair to climb onto the stove and get the remnants of a Frito Pie that I had set aside for Briar. Her body may be rejecting her skin, but there is nothing wrong with her nose. 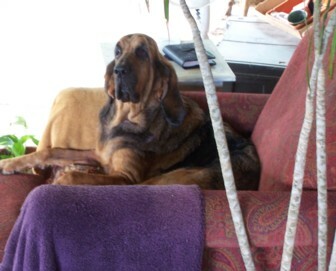 She is a Bloodhound, a nose with feet . . . and Frito Pie on her breath. And she is a thief . . .
That pretty much settled the issue on whether it was time to put her to sleep. The vet came and looked at her again last night. She is ugly, she is stinky, but she is happy. And that's the only thing that matters. I have to agree that Alice still has a desire for life (and food). I guess that as long as she can still steal food, she wants to see the sun come up on another day!